I may not be a spring chicken but I know a good day when I see it. 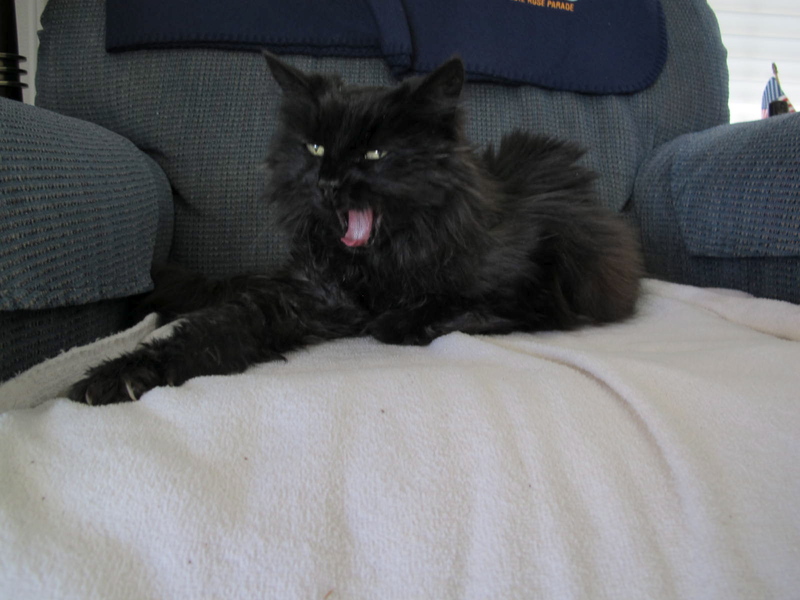 Here I am striding toward the camera, just like any other diva. 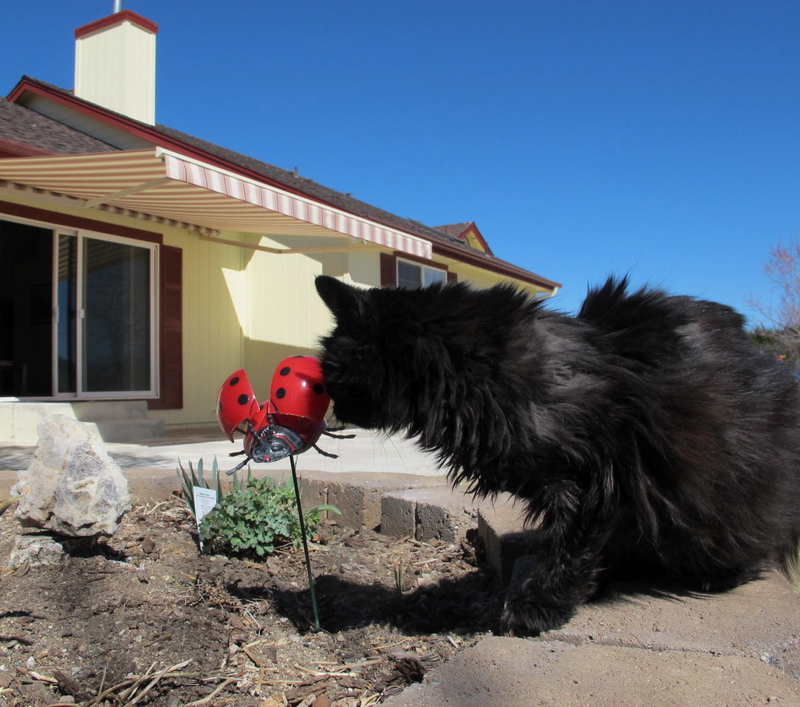 I stop for a sniff at a lady bug. No response, so I move on. 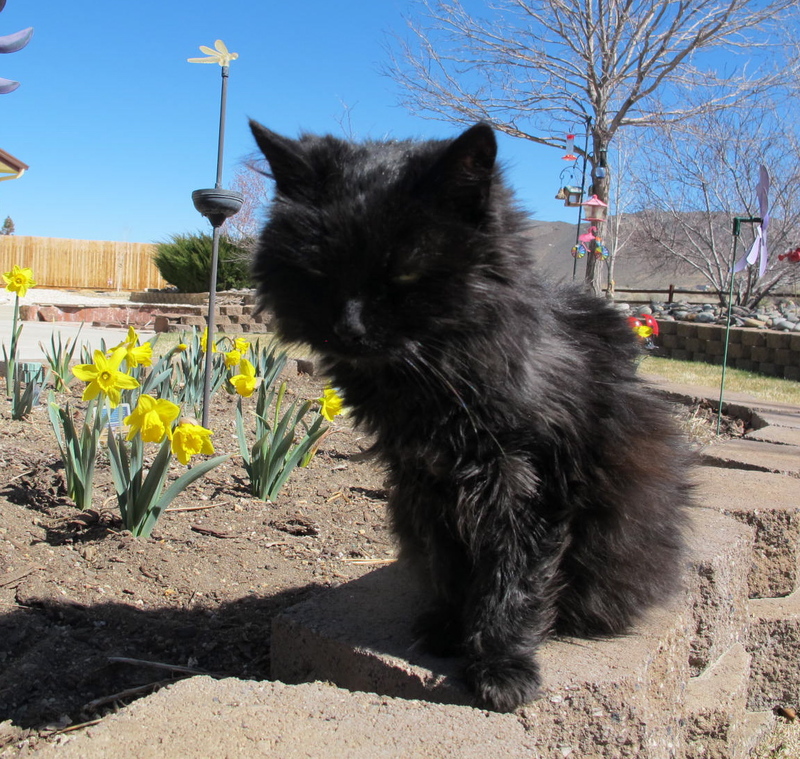 A stop by the daffodils but they aren’t what I’m really looking for. HERE IT IS! 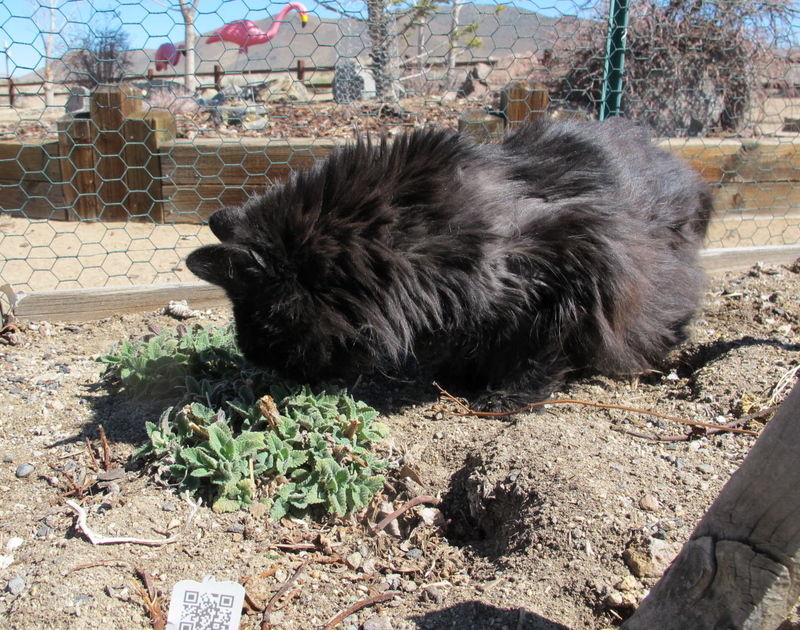 Some catnip coming up from Mom’s last year’s garden. YEA!!! This stuff gets me going! Well, on second thought, I think I’ll go back into the house to take a bit of a snooze. 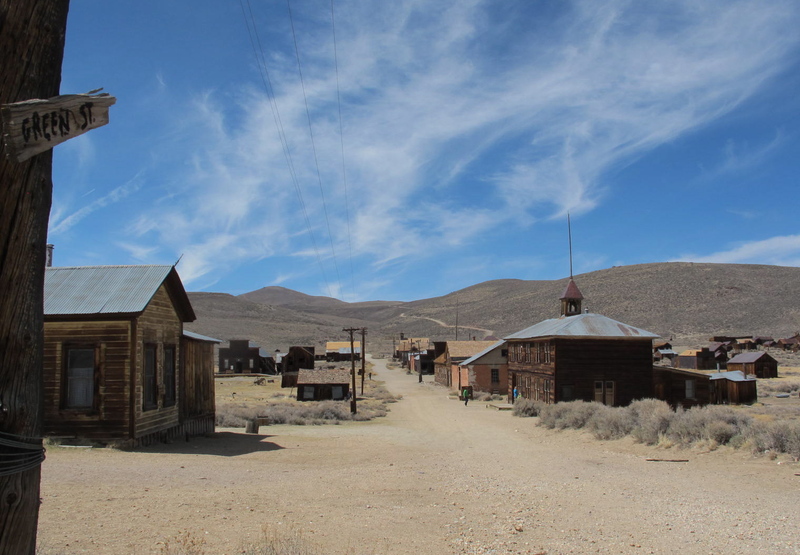 It was a glorious spring day with beautiful blue skies and wispy clouds when Diana and Jack asked me to join them and son Jim and their two dogs, Lucy and Molly, to go to Bodie, an old mining town. 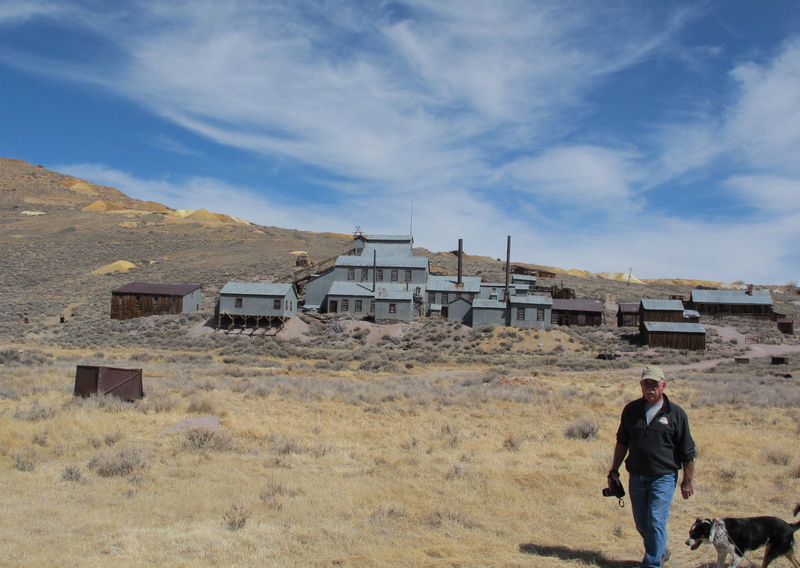 Never one to turn down an outing, this promised to be a lot of fun as I hadn’t been to Bodie in about 25 years. 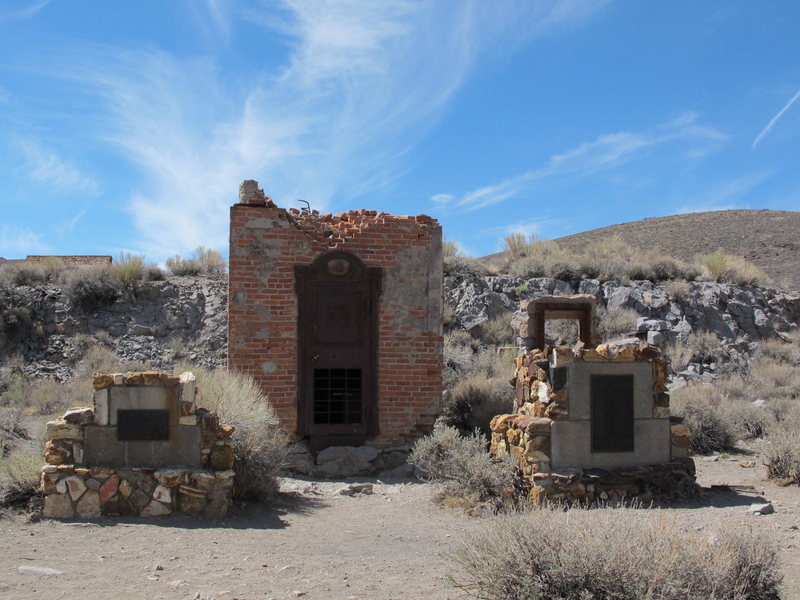 By 1879, Bodie boasted a population of about 10,000 and was second to none for wickedness, badmen and “the worst climate out of doors.” One little girl, whose family was taking her to the remote and infamous town, wrote in her diary, “Goodbye God, I’m going to Bodie.” The phrase came to be known throughout the West. 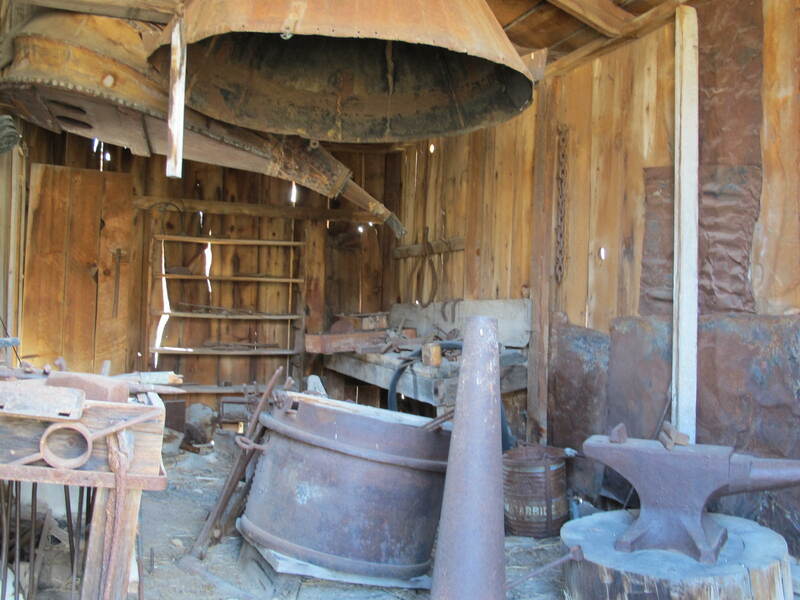 Bodie lies about 13 miles east of Highway 395 and about seven miles south of Bridgeport, CA. I think one reason the town in such good shape is that it’s far off the beaten track and part of the road is dirt, gravel and some rocks. One has to make an effort to get there and the road is not open for several months of the year. The climate is still wicked during the winter. I surely wouldn’t want to be there in the winter with the wind howling and snow drifting all over. A picture in a brochure showed men standing on the roof of a store and snow is just a few feet from their boots. 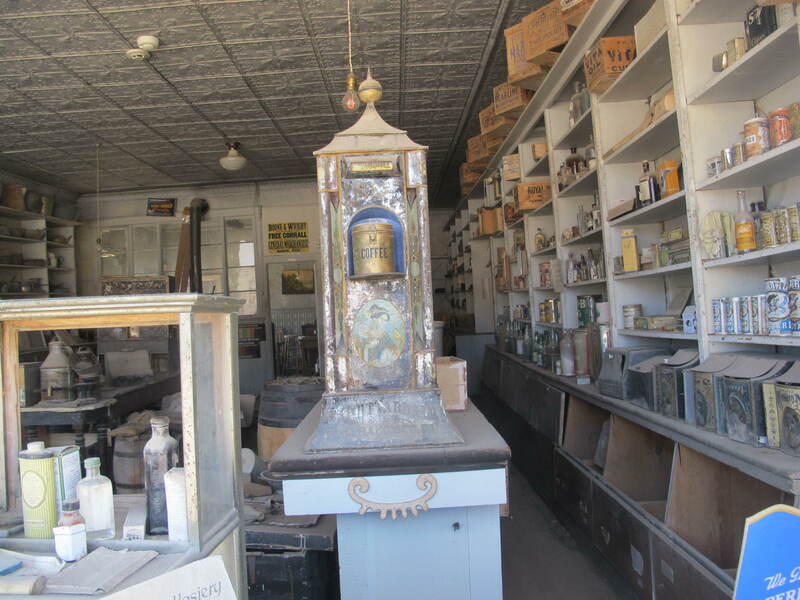 Designated as a National Historic Site and a State Historic Park in 1962, the remains of Bodie are being preserved in a state of “arrested decay”. Sadly, only about five per cent of the buildings it contained during its 1880s heyday still remain. 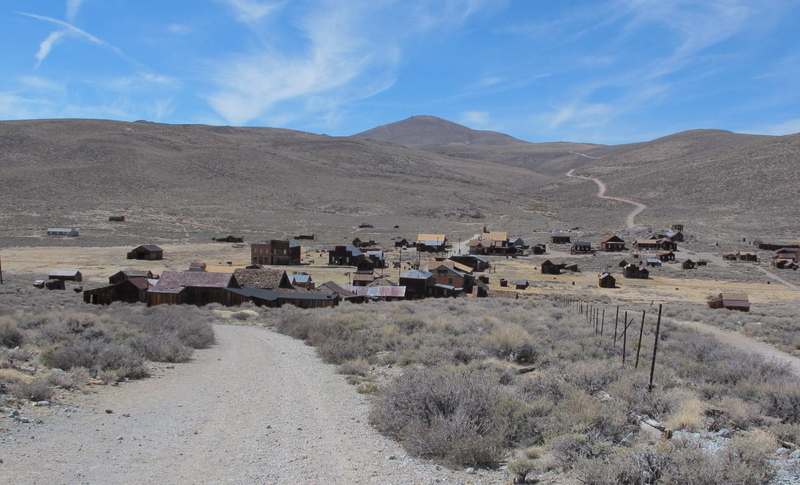 Today, it stands just as time, fire and the elements have left it—a genuine California gold mining ghost town. 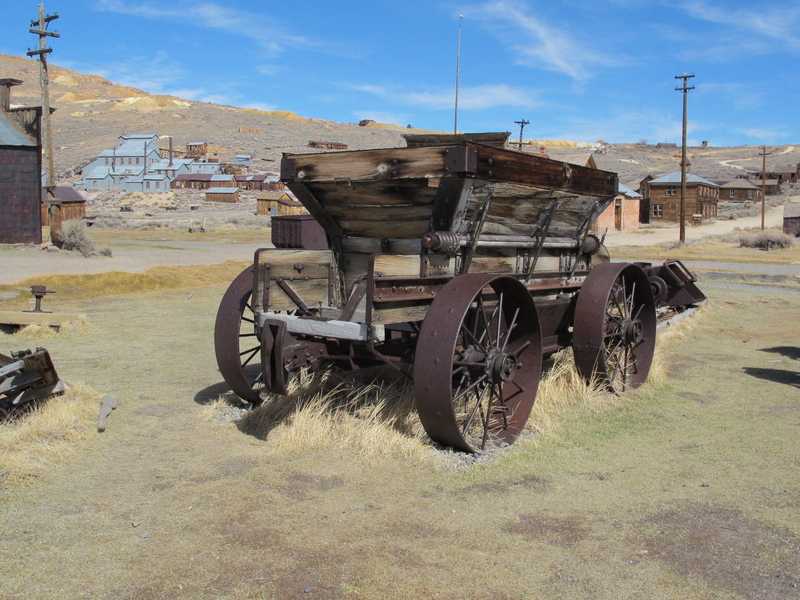 The Lampe family, who owned Jack and Diana’s property during pioneer days, used to take a wagon to deliver cheese, eggs and other goods to the Bodie miners. It took them three weeks to get there from Gardnerville! Apparently it was worth the trek as they made some good money doing that. 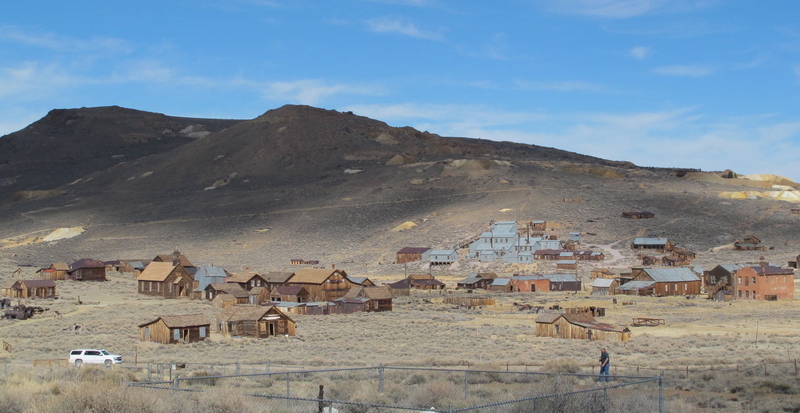 It took us just a couple of hours to get to Bodie. I think I like our transportation better. Of course, one of the first buildings I peeked into was the school, built in 1879. Originally the Bon Ton Lodging house, it became the school when an early-day juvenile delinquent burned down the first school. You can see electric lines and poles. 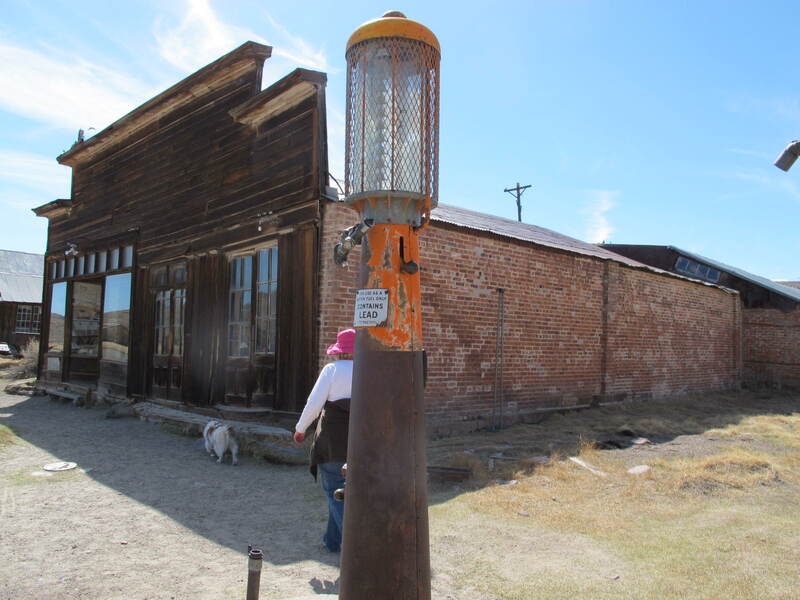 Electricity was available during late 1800s from a hydroelectric plant built about 13 miles from Bodie. The school is the building with the spire on the right side of the street. Looking west toward the Miners Union Hall, to the right of the large building (that looks like two buildings) in the center of the picture. The morgue and undertaker’s office is to the right of the Union Hall. Caskets are still inside of it. The Standard stamp mill where much of the processing and refining process was done. Jack and Lucy are in the foreground. The Stuart Kirkwood Livery Stable and blacksmith shop. Note the size of the bellows behind the hood. 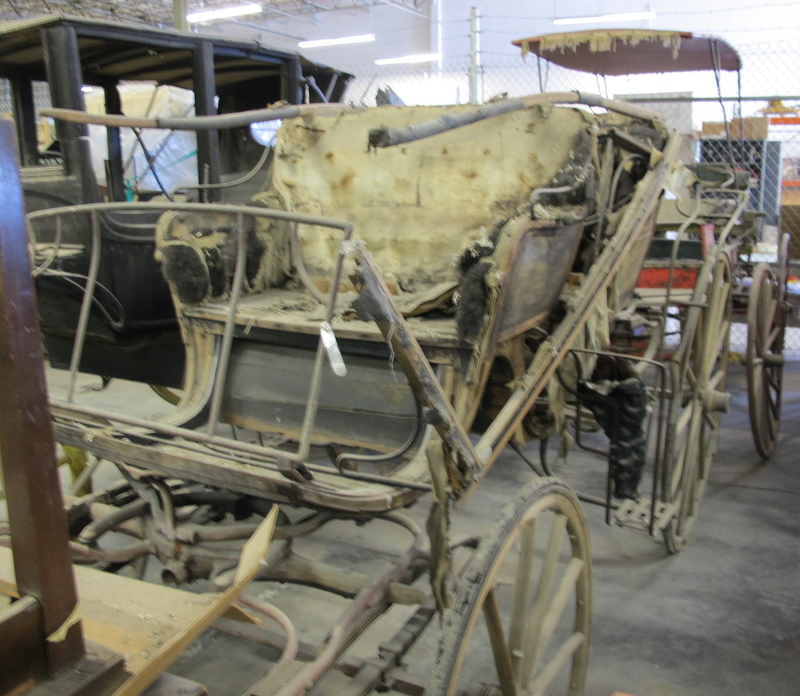 Many wagons and literally hundreds of horses, mules and other draft animals were required to haul in tons of goods daily. The town jail was a busy place what with killings occurring almost daily. A minister in 1881 pronounced Bodie as a “sea of sin, lashed by the tempests of lust and passion.” Bail for “guests” was $5. 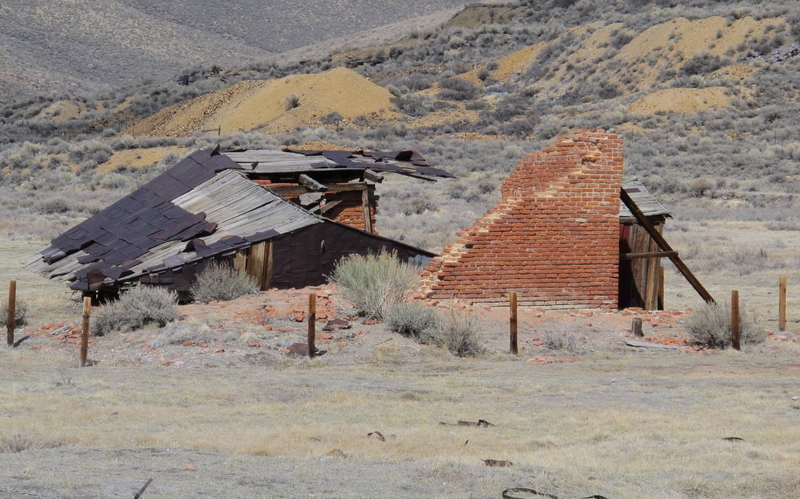 Joseph DeRoche was taken from here by the Bodie “601,” a vigilante group, and hanged. He must have done something terrible to rile up those vigilantes like that. 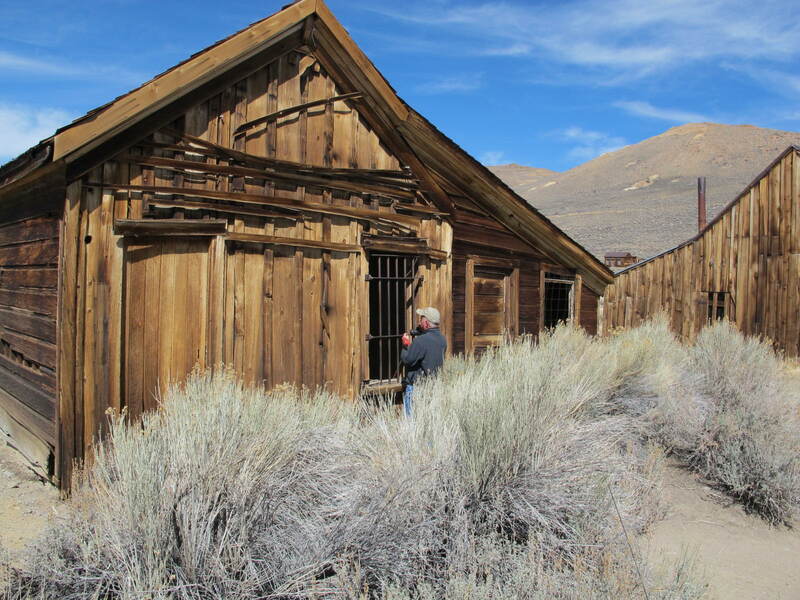 Probably one reason the jail was busy was that there were 65 saloons in Bodie. There were many opportunities for the miners to find R and R after a hard day’s work and then possibly find trouble. People had other needs, too. 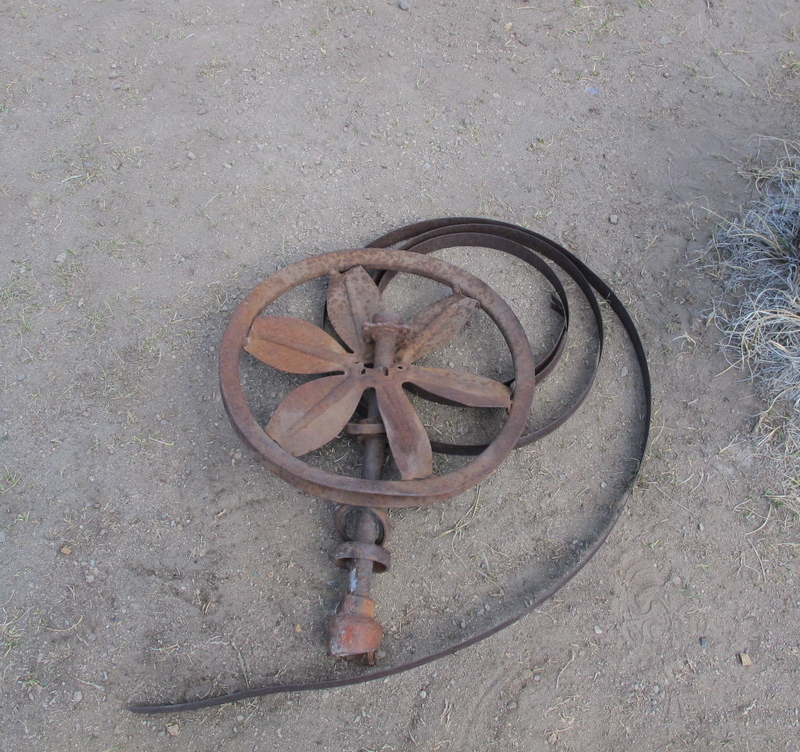 This was a two-holer that has sunk into the ground. The Mastretti Liquor Warehouse is in ruins now but we could see very thick brick walls and a vault-like door that would have protected the booze from thirsty miners. Boone Store and Warehouse, erected in 1879. Harvey Boone was a direct descendant of Daniel Boone. An old coffee grinder in the Boone Store. With so much stuff on the shelves, it almost looks as if the store could open up tomorrow. 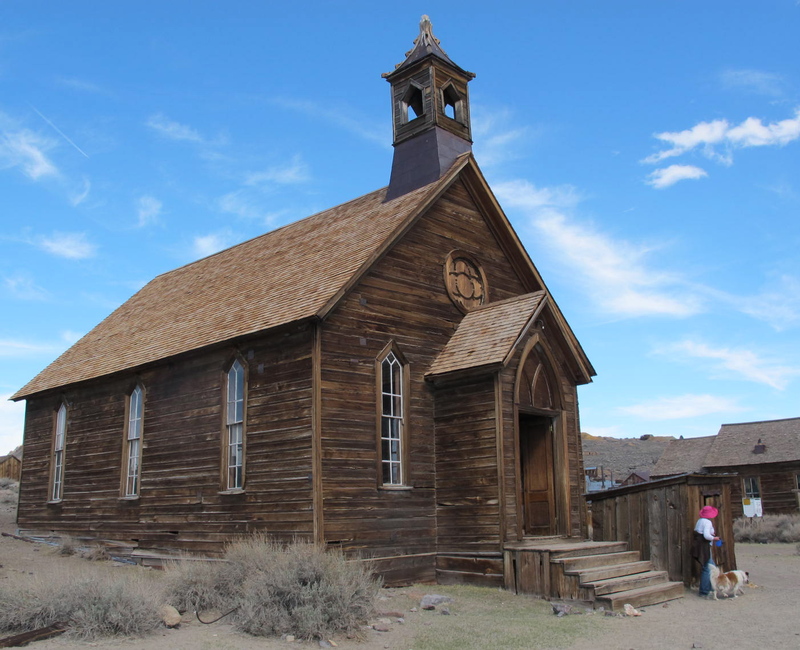 The Methodist church was erected in 1882 and was the only Protestant church in Bodie. E.J. Clinton of San Francisco restored the Methodist church and held the last service in 1932. Since then, the interior has been badly vandalized, and the Ten Commandments painted on oilcloth which once hung behind the pulpit (“Thou shalt not steal”) has been stolen. A Catholic church, also built in 1882, burned down in 1928. 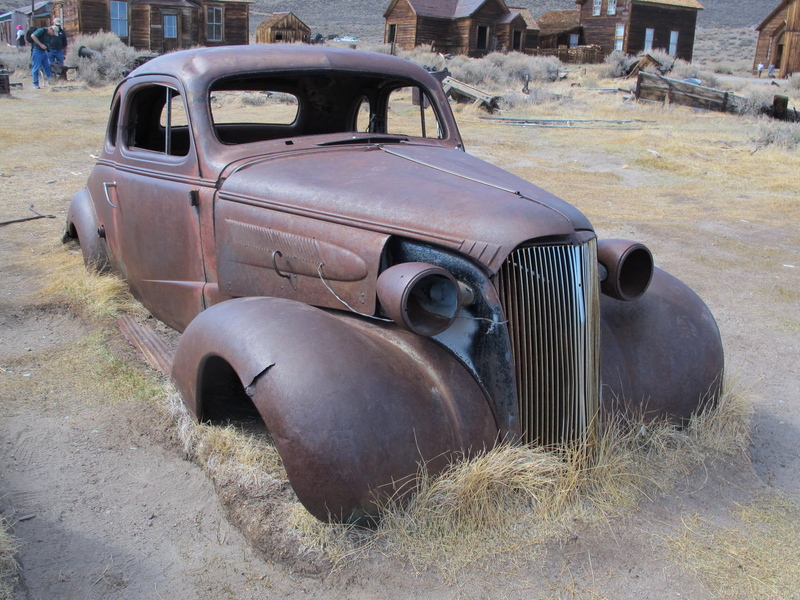 Cars, trucks, wagons, carts, wagons and equipment are strewn all around Bodie. I bet this 1937 Chevy coupe was a hot car in its day. A clever poet could write a requiem for these abandoned vehicles and pieces of equipment. It just seems sad to seem them sitting in the dust. Our last trek was to the cemetery, which is actually three cemeteries; Ward’s (the first undertaker), Masonic and Miners’ Union. We were free to wander around the graves and had to be careful not to disturb any of the little colored flags that we could see between gravestones. Those flags depicted unmarked graves that human remains detection dogs had alerted to. One of the weather-beaten grave markers in the cemetery. The smaller one at the foot of the grave might have been for a child. 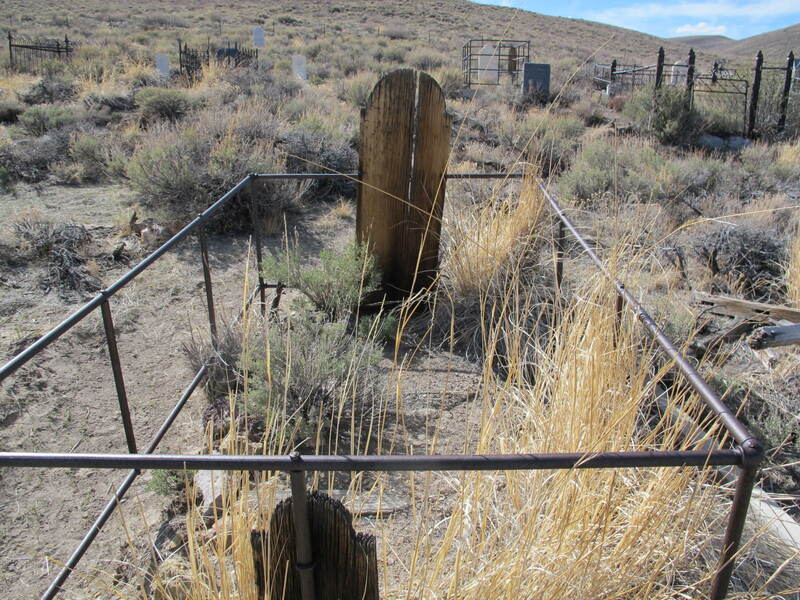 Bodie’s Cemetery: Lives Within told several stories about some of the inhabitants of the cemetery. A.C. Robertson died 1880. Tried to thaw out frozen powder in his oven. Chatto Encinos, 1880. Killed by Sam Chung for raiding his vegetable garden. James Kennedy, 1880. His fumbled draw and bad aim put him six feet under. One headstone is outside the fenced cemetery. That is of Rosa May, a prostitute, who died in 1911 or 1912. To this day, people leave money on and around her headstone. 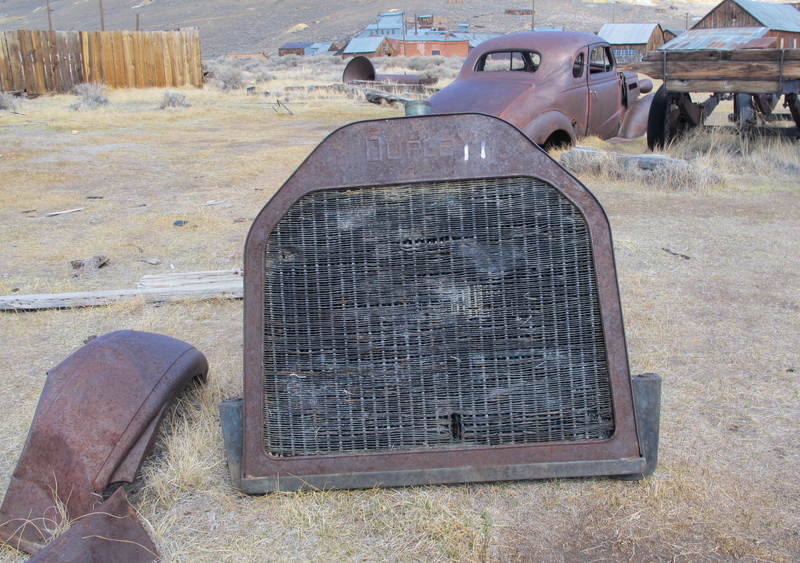 The visit to Bodie was enlightening and I am very glad that no one is allowed to move, pick up or take anything from the park. It’s great to see these artifacts in situ and to imagine folks going about their daily business during the mining booms. About 18 months or so ago, Jerri and I attended training to become tour guides at the Nevada State Museum (NSM) in Carson City. This was shortly after I moved to Minden/Carson Valley and I thought it would be a good way to meet people and learn more about Nevada history. This was accomplished and I’ve been enjoying giving tours of the museum and the state capitol to students and tourists. This was basically all I ever wanted to do at the museum and that is how it went for the first six months or so. Then I was asked to help with Friends of the Nevada State Museum bake sales during the NSM Coin Show (August) and Nevada Day (October). 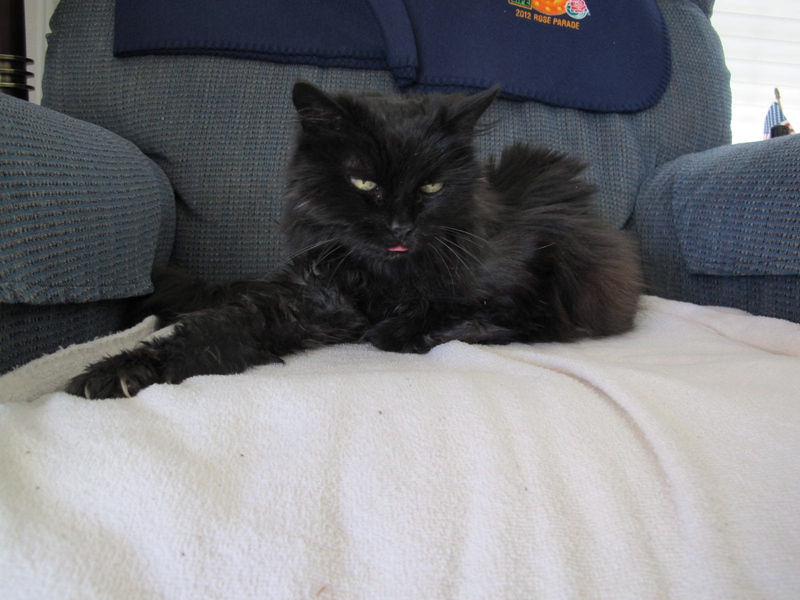 The original chair was involved in a bigger fundraiser for the museum and needed help. Well, that didn’t seem like too much work, so I said yes, I’d help. I think she neglected to tell me that acceptance meant that I’d be a member of the Friends Board. How did that happen? Then, the same chair (now the major fundraiser committee) asked me to be Black Barbara in the play she and others were writing to perform at the Museum and also the encore performance at the Governor’s Mansion. They said they were desperate and I’d be perfect for Black Barbara. How can I resist such flattery? Soon, I was attending rehearsals and what not, getting ready for the big nights. 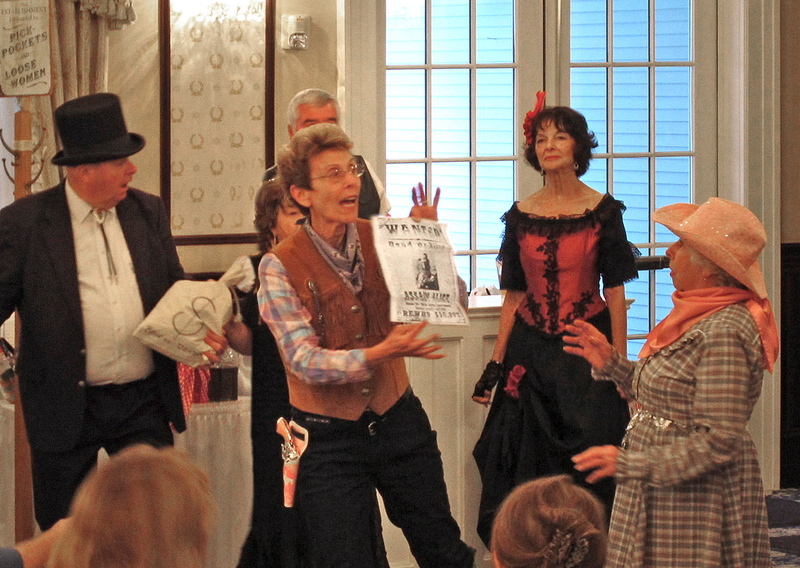 We raised a lot of money for the Museum and it was good. But, how did that happen? 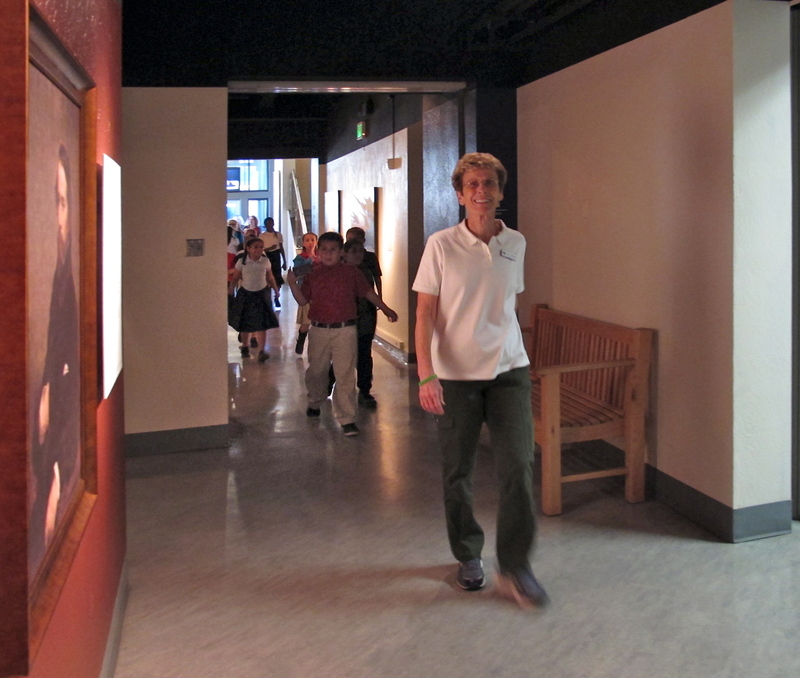 The year moved on with meetings, tours, and Friends’ field trips to other museums. Then, the Friends learned of a collections crisis in the NSM’s storage facilities. In a nutshell, the museum desperately needs additional space to house artifacts and collections according to standards of the American Alliance of Museums. I could write for hours about this stuff as I have learned so much. 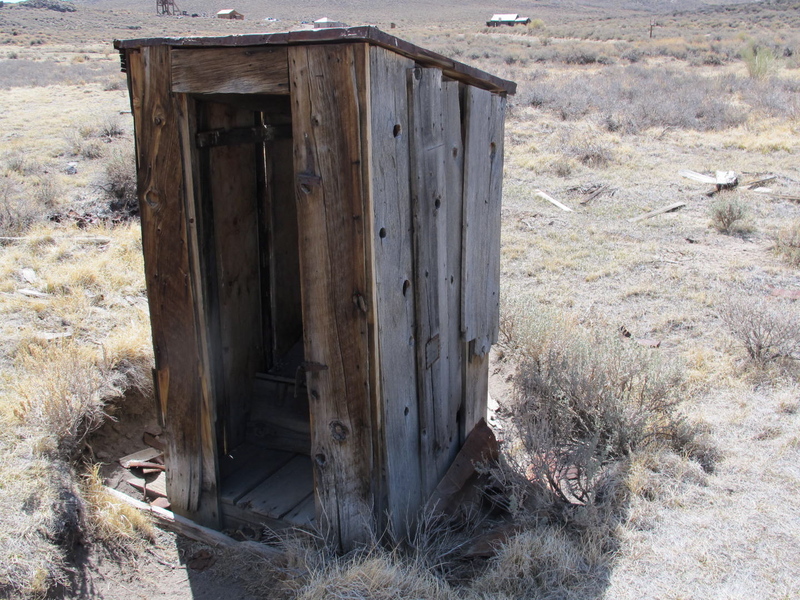 I won’t go into the details of the facilities (especially items stored at the NDOT(NV Dept. of Transportation) facility. Trust me when I say our collections are in crisis and many artifacts are in danger of being destroyed by air quality, dust, vermin and pigeons. I began to learn about this crisis when Jim Barmore, Director of the NSM, spoke about it at one of our Friends board meetings. I innocently asked how we could help, thinking he’d probably say that we could volunteer to help clean up the facilities and help with artifacts. But, instead, he suggested that we write letters to the governor and legislators about the state budget, explaining the needs and how critical the situation is. So, we mounted a campaign and I actually wrote quite a few letters. (I NEVER did that in California. I NEVER thought that anyone there would pay attention.) Many of us actually received letters in response. They were diplomatic and didn’t really say much, but I felt good about them anyway. Then the state budget was presented and the storage addition proposal wasn’t on it. Rats!!! It’s the same old story. There is never enough government money to go around. We talked about it in our next board meeting. We decided to write stronger legislative letters including pictures and perhaps contact a TV station and the Nevada Appeal (our local newspaper). 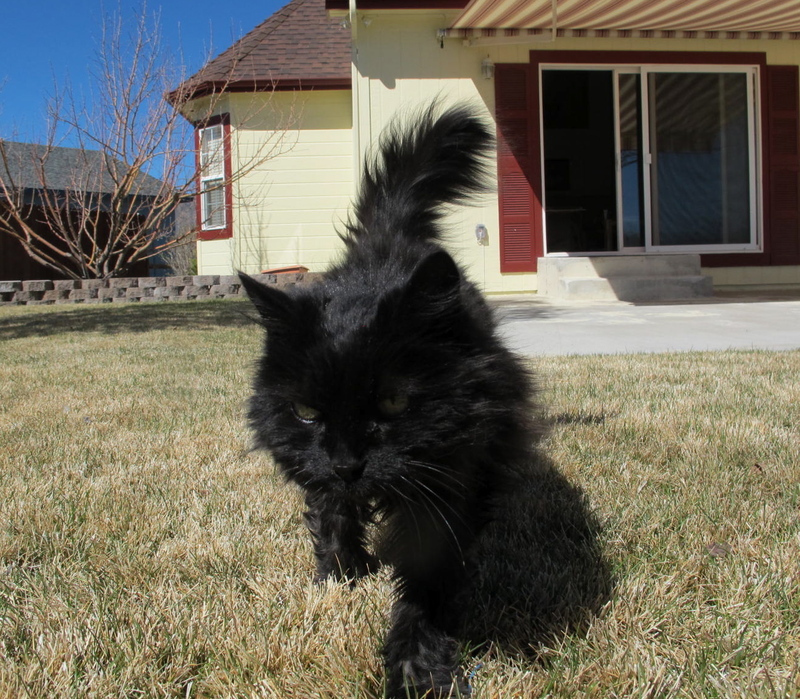 I emailed the pictures and a little packet to the Reno ABC affiliate and they actually sent a reporter that very day! The report was aired that evening. Pretty good, huh? The same day of the TV report, I received a letter from the Senate Chair of Finance. He suggested that I attend the Assembly Committee on Ways and Means and speak to try to make the museum’s case there. So I worked hard to prepare a speech accompanied by the pictures and the packet and I went to the meeting on April 10. (It was a momentous day as it was the first time I’ve worn a skirt since moving to Nevada. A real sacrifice!) Two other Friends went with me and we made our points. Speaking in front of the committee was daunting and exciting at the same time. Don’t want to do it again, though. How did it go from just writing a one-page letter to speaking at the Legislature? I don’t know. It just happened. Unfortunately, all this effort will probably go for naught. The Nevada legislature meets biannually for 120 days only. By the time we got involved with the process, budgets had pretty well been set. But, there is a very slight hope that something for the museum could be appended to another bill at the tail end of the session. Another way to look at it is that seeds have been planted. Some of the fertilizer (and it wasn’t BS) that we talked about might stick on the walls and something may come of it in the next biennium. So this is my saga about things mushrooming. This epistle might sound like a giant vent, but it really isn’t. I’m just wondering how these things happen.